"This is about my life and my life is important." The mission of the Kids' Court School is to educate children and youth about the investigative and judicial processes, utilizing a standardized, evidence-based curriculum in order to maintain the integrity of the legal process; to conduct ongoing research aimed at maximizing the potentially traumatic effects of the courtroom on children; and to serve as a training program regarding best practices for educating children and youth about the judicial process. That’s really always been my mission: to enable children to tell their story in court. – Professor Rebecca Nathanson, Ph.D., Founder & Director of Kids' Court School. 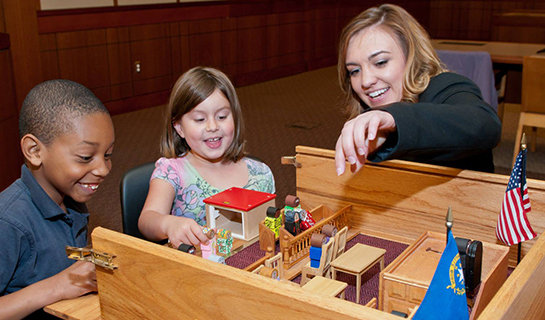 The UNLV William S. Boyd School of Law recently partnered with The National Judicial College (NJC) to expand to Northern Nevada its Kids' Court School, an award-winning program that educates children about the court process. The Kids' Court School celebrated helping 1,000 children in Nevada. The Kids' Court School, a 2012 Harvard University Bright Idea Award winner, is a nationally recognized program that educates children and youth about the judicial process and teaches strategies to reduce system-related stress. The Kids' Court School, run with the help of law students, garnered a Bright Idea award from Harvard University. The annual Bright Idea award recognizes programs that can be models for improving government at all different levels.